Do you have flat feet that are causing you discomfort? A lot of people with flat feet don’t have any problems but others aren’t so lucky. For those of you in the latter category, there is some hope! I wanted to put this guide together to give you some information on why it happens and how to correct flat feet. Why Having Flat Feet is Bad? Having flat feet means that your feet arch is low. Sometimes, you won’t have an arch at all. If this is the case, your feet will be flat to the floor. In this study, feet were considered ‘flat’ if two fingers couldn’t slip under the arch while standing. There are actually two types of flat feet: flexible and rigid. A flexible flat foot tends to develop in your teens or before. With this type of flat foot, the arch disappears if you stand. When you sit down or go up on your tiptoes, the arch is normal again. This will be the case for both feet. With a rigid flat foot, the arch is never present. This is often due to bones in the foot not being in the right position or alignment. A rigid flat foot is more likely to cause problems for this reason compared to flexible flat feet. Vertical t﻿alu﻿s develops when the lower bone in the ankle (the talus) isn’t positioned correctly. Tarsal coalition is another reason for rigid flat foot. This develops when bones in the foot connect together that should be apart. This can become obvious later on compared to the vertical talus. Flat feet can be genetic. If flat feet run in your family, there’s a greater chance you’ll have them too. Being overweight puts extra strain on your foot, especially the foot arch. If it happens as a child, it can put a lot of stress on the foot and lead to flat feet developing early on in life. Are flat feet always bad? Not necessarily! Research from the Army suggests that flat feet can be better than high and even normal arches. Recruits with flat feet tended to develop fewer injuries than other feet types - even ‘normal’ ones! If it causes you a lot of pain, this is obviously a cause for concern. This is where self-help treatments can be useful. Not all flat feet fall into this category though. Some other foot types can cause issues too. Having a high arch can be problematic. In particular, this can mean that your feet don’t absorb shock and pressure that well. If you’re athletic, this can be bad news. Flexible flat feet can often absorb pressure quite well compared to high arched feet. Foot pain can have many different causes so it’s important to know if flat feet are the problem. Knowing whether you have low arch is a simple test for this. You can do this by looking at your wet footprint. If you have fallen arches, your footprint will include the entire sole of your foot. With higher arches, this isn’t the case and the footprint is narrower. If your flat feet are causing you problems, there are a few treatments you can try to correct the situation. Performing toe raises on a stair can improve arch strength. The step should be 3-4 inches up from the ground so that the ball of your foot is on it. With your foot in a neutral position, go up on your tiptoes and press down with your toes. Coming back down, it’s key not to bring your heel down too far as the focus is on the foot arch. Most people can do 3 sets of 10 raises without being in a lot of discomfort. 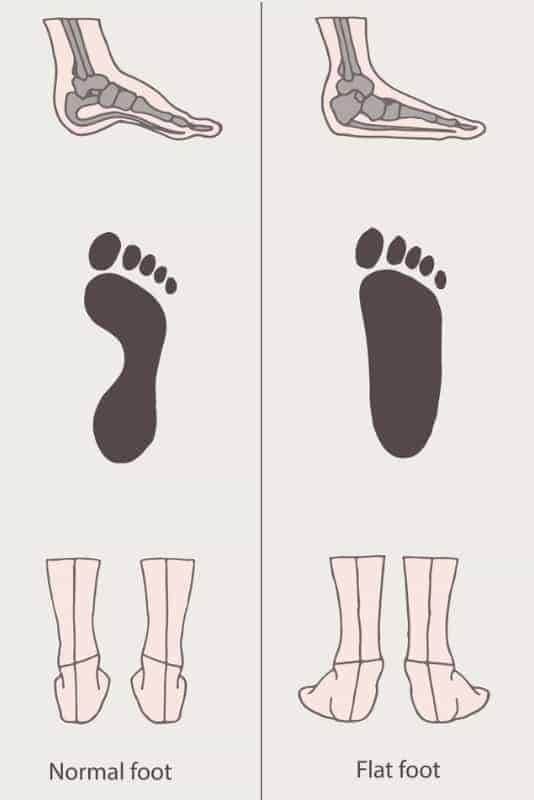 It may not seem connected but the muscles connecting the big toe are crucial to fix flat feet. The big toe supports the bridge under the foot and if it doesn’t do this, the arch can collapse. Toe Yoga is one way to strengthen the toe muscles and prevent this. The idea of Toe Yoga is this: you need to raise the big toe and the other toes in isolation to each other. This involves pressing down with your big toe and lifting the other toes up. Likewise, raising your big toe while pressing down with the others. It’s not as easy as it sounds and is great for strengthening the toe muscles. Pro Tip: If this feels too hard, practice with your big toe to begin with. Once you can move it in by itself, do the same with the other toes. This will work the muscles too and get you used to isolating them. You can use a tennis ball to improve the flexibility of muscles and tendons in your foot and lower limbs. Stand close to a wall and place a tennis ball on the floor. Put the ball of one foot on top of the tennis ball, with your heel flat to the floor. Lean your upper body towards the wall so that you feel the stretch more in your foot, ankle and the bottom of your leg. Hold the stretch for around 5-10 seconds and repeat with the other foot. Pointing your toes away from your body helps to make the calf muscles stronger. Sit or life with your feet in front of you and move your foot towards your body. Your legs should be flat to the ground throughout this. Hold this stretch for around 5 seconds and then push your toes away from your body. Pro tip: Using an elastic band will make the stretch even more effective. Taking the weight off your feet as much as you can is a good move for relieving pain. Icing your feet can also help with this. Rest can be particularly beneficial if your flat feet are due to being on your feet a lot. Stretching exercises can work the muscles and connective tissues in your feet. This can help to stop your feet rolling inwards. Tight calf muscles can go hand in hand with flat feet and fallen arches in particular. One calf stretch that can counteract this is to lean against a wall and go up on your toes. Then slowly come back down again. Do this 10 times. Pro Tip: Once you get the hang of doing this on both tiptoes, try doing it with one foot before switching to the other. Another option is to lean with your hands on a wall and step towards it with one leg so that the knee is a bit bent. The other leg should stretch behind you with your heel on the floor. As you lean into the wall, you should feel it stretching your calf. Hold for up to 30 seconds and repeat a few times. You can use a towel to stretch your Achilles. This can relieve discomfort and help to stop your feet rolling inwards as much. Sit on the floor and put a towel around the balls of your foot. Keeping your chest and knees straight, bring the towel back towards your body. You should then feel a stretch in your Achilles and calf. Hold for around 30 seconds and repeat up to 10 times. If your flat feet are causing you a lot of pain, taking over the counter remedies can help. Nonsteroidal Anti-Inflammatory (NSAIDs) such as ibuprofen can work well. It’s best not to take these for longer than 2 weeks at a time though. If you’re not seeing any improvement by then, speak to your doctor. There may be an underlying problem behind your flat feet that need a referral, for example. Using special inserts in your shoes can offer support and stop them rolling inwards. If your feet roll inwards, it can cause pain in your legs and even your back. One study found that custom orthotics have the potential to encourage an arch to form. Custom orthotics can also help to correct misalignment of the feet, ankles and even the hips and back. Orthotics also support the foot arches, especially when standing. This can reduce pain quite a lot if the orthotics are custom made. Studies﻿﻿﻿﻿ have shown that with supportive shoes, it can make a lot of difference to pain levels. Acupuncture can be a natural treatment for pain in general but what about foot pain? Some studies have suggested it can relieve foot pain. If arthritis is a factor in your flat feet, acupuncture can tackle the inflammation. Acupuncture won’t make your feet less flat but it can be useful if your flat feet are causing discomfort. Wearing supportive shoes that fit well is important to fix flat feet. This can help to reduce foot pain caused by flat feet. If you’re using orthotics, it’s important to wear well-fitting shoes to get the best out of them. Studies have shown that wearing supportive shoes and orthotics can reducing painful flat feet. Two types of footwear that can be good for flat feet are motion control and stability control shoes. The latter have cushioned insteps around the arch to support it. This also makes them more comfortable if you have a low arch. Running shoes can be a bad move for flat feet can encourage a forward motion, which doesn’t benefit flat feet. If you do want to go running, motion control footwear can be a better bet. Taping your feet in a certain way can help to support the arch and stop it falling as much. Knowing how to do this yourself can be tricky if you’ve not learned from a professional but how-to videos can help. A low arch is linked to a high Body Mass Index (BMI) so your weight can have more effect on flat feet than you might think. The more weight you carry, the more pressure on your arch. Because the arch needs to keep its shape to support you, extra pressure can be a problem. It can cause the foot arches to fall. There is also a less obvious factor too, which involves weight distribution. Some people who are overweight carry their weight forwards in the stomach area. This can make your weight distribution unbalanced and your body has to compensate. Your posture is generally the way this happens and the end result can be your feet rolling inwards. If you have had flat feet all your life, being overweight can lead to Adult Acquired Flat Foot Deformity. This is a more severe type of flat foot that can cause more problems with mobility and stiffness. Studies have suggested that being more active can affect on foot arches and foot shape. Surgery is generally a last resort to correct flat feet. Recovery can take up to a year so it’s not something you’d want to jump straight into! It may be necessary sometimes if there is an underlying problem causing your flat feet. If self-help treatments don’t have any effect and your flat feet are painful, you may need surgery. For example, a problem with the alignment of the bones in the feet will often need surgery to correct this. This can help to restore a healthy amount of pressure on standing and walking. There are a few different cause pain, depending on the cause of flat feet. Weight bearing generally starts at around 8 weeks after surgery though. Before this, you won’t be able to put weight on the foot that has been operated on. Running barefoot puts less pressure on the heel and the knees and hips absorb less pressure too. A study on children found that flat feet were a lot less common for those who went barefoot a lot. If your flat feet are genetic, there’s not a lot you can do to avoid the problem completely. If you’re worried that things will get worse in the future, there are some steps you can take to make it less likely. If these treatments don’t help to fix flat feet pain, it may be time to see a podiatrist. This can check if there are any underlying reasons for your flat feet that may need correcting. This is particularly important if you have pain and it doesn’t get better with self-help measures. If you have pain in the legs, ankles, knees, back and/or hips, it’s an even bigger sign that you need help to correct flat feet. As you can see, there are lots of things you can do to fix flat feet - most of which don’t involve surgery! I hope you enjoyed reading this piece and got some good tips on how to correct flat feet. If you found it useful, please feel free to share it so other people can do the same!